– Are you an active person who like the outdoors were rough terrain might become a problem? – Then you need to get something with a little more power, higher ground clearance, better tires and good suspension in order to make due. We have a few good suggestions for the active person to choose from and they are all great choices, depending on how off-road you’re going. Keep in mind that these types of mobility vehicles have a much more comfortable seat, more power, and better suspensions, to name a few things. The price tag will reflect these much-needed features. There are yet no studies showing that extensive use of mobility scooters can impact your health in a negative way, but it feels pretty self-explanatory that using your scooter too much can furthermore limit your movement in the long run. So keep going with your rehabilitation routine and don’t get too lazy, because these picks are really comfy. Like an ATV, but really a mobility scooter with fantastic off-road capabilities. These scooters were not just made for your day-to-day living, they are made to improve your life on every level, bring back memories, and get you back out there. Wherever out there might be. Perhaps this has been one of your previous hobbies and you now think you’d never be able to go on an outdoorsy adventure again. Well, it’s time to re-evaluate. Your disabilities may hold you back from hiking on foot, but there’s nothing saying you cannot enjoy the outdoors like you used to. In fact, studies show that disabled people’s need to go outdoors into the countryside or woodlands are more complex than just rehabilitation; they like their non-disabled counterparts want to access the outdoors for the means of well-being and revitalization. Strolling around one of USA’s beautiful parks might not be an option if you purchase for one of the simple models. Parkways are many times made out of gravel or dirt and can easily make even the most beautiful recreational experiences, a not so comfortable hell. 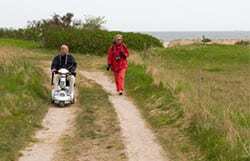 However, if you get a more versatile scooter you can ride along the gravel pathways, go through the grassy plains and do so comfortably. However, if you get a more versatile scooter you can ride along the gravel pathways, go through the grassy plains and do so comfortably. We aren’t talking about just going to the beach. We’re talking about going on it. These mobility scooters have no problem taking you all the way down to the edge of the water so you can get that blanket of yours out and mount that sun lounger without having to walk zig-zag through the masses of sun-worshiping people. Those romantic “walks” at the beach you hear about or even used to take with your loved one can come true once again. Ride along the beach and enjoy the sunset. These sturdily built vehicles provide you not only with high quality and comfort. They are versatile and can be used pretty much anywhere, they all do their best under different conditions in order for you to easily find one that will fit perfectly into your style of life. They take you where you’d like to go and there is nothing that hinders you from living the life you want to pursue anymore. If you’re thinking about going up steeper hills and really pushing your off-road experience then there is just one choice right now. The Vita monster s12x is a great mobility scooter with enough raw power to get you up most hills. I would consider it more of an ATV for people with mobility problems. 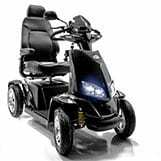 It’s a really comfortable ride and you’d be able to tag along on any outdoor adventure. 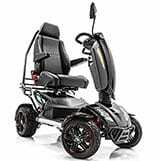 It is equipped with a 900-watt motor which provides high torque in order to let you climb steep hills with ease. It’s sturdy and the only downside with the Vita Monster is that customers have complained about the wheels needing to be replaced once in a while. Could just be them riding the monster of mobility scooters a bit rough though? This scooter is a great choice for younger people who might want to enjoy the same activities as their friends. 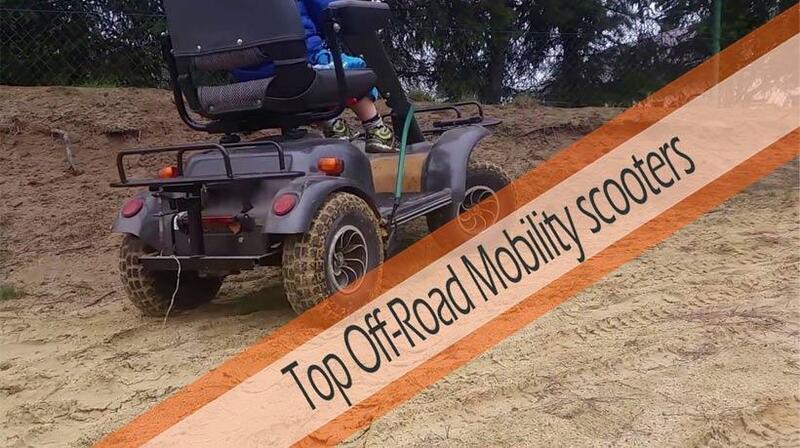 Many use it as a substitute for an ATV, even though you might not get the same speed you’ll be able to enjoy the outdoors with your family and friends, problem free on 4 stable wheels. 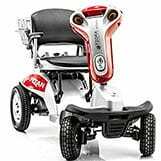 Rides smoothly over rough and uneven surfaces thanks to its front and rear suspension system. The Silverado Extreme are built for those who like to go great distances without having to worry about recharging anytime soon. It has an upgraded battery with an incredible 100Ah which gives you approximately 55 miles to ride on a single charge, which is unbelievable. This one stuck like glue on our brains after testing it, such a joy it was. Full suspension system with shock absorbers which makes it a comfortable ride even on the roughest of terrains, making it a great choice for those who are looking to buy back their ability to go to the far outdoors. It has a cool sporty almost scooter look to it and comes with clear LED-lights and an LCD display that shows you: Battery gauge, Accumulated usage hours, Temperature and Maintenance messages. It is a heavy-duty mobility scooter which can assist a person of up to 450lbs. Here’s one that’s actually done quite well in our mobility scooter comparison, the Hummer-XL Tzora Titan 4. It’s a great power scooter for disabled people who want the ability to ride on rougher terrain but don’t want to pay the big bucks. It might not be as comfortable as the Vita Monster or the Silverado extreme, nor does it take on these types of terrain just as good. But for the price you pay, you get a good somewhat versatile scooter that can handle gravel and grass quite well. It’s easier to transport due to its folding mechanism where you can detach it into 2 parts weighing under 60lbs each. The front and rear suspensions are a bit hard but do provide better comfort than a standard non-suspension model. The ground clearance, however, we think could have been much better. We wouldn’t recommend going way off-road with the hummer xl, but for hiking on a decent trail it will get the job done. When it comes to these much more expensive scooters you really have to think about your options. If you’re really serious about getting something that can take you for a ride on even the most unforgiving terrain then going for the higher priced units is a must. Remember that there are also the standard off-road electric scooters to consider if you can still stand comfortably on your own. For example our favorite choice the Vita Monster s12x, this isn’t like any ordinary mobility scooter we’ve reviewed and you get exactly what you pay for. There are a ton of great features and perks that we are sure will help you out, even on the dirt roads. With the scooters built for uneven surfaces, you get the top 10% luxuries, features, and comforts that will make the ride of a lifetime.